Surfcaster.com! Photos, recipes, books, tackleshops, and the best fishing forums on the net! After a day on the water, why don't you try something new with your catch? With an ever growing database of seafood recipes, finding something new should be easy. 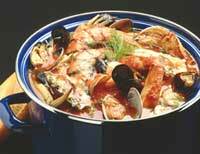 Got a seafood recipe? Send it to us! Bluefish are popular game fish due to their eagerness to chase almost any moving bait and sporting way they fight when hooked. They make excellent food but only when eaten fresh as they do not freeze or package well. Copyright 1996 - 2010 Surfcaster.com.